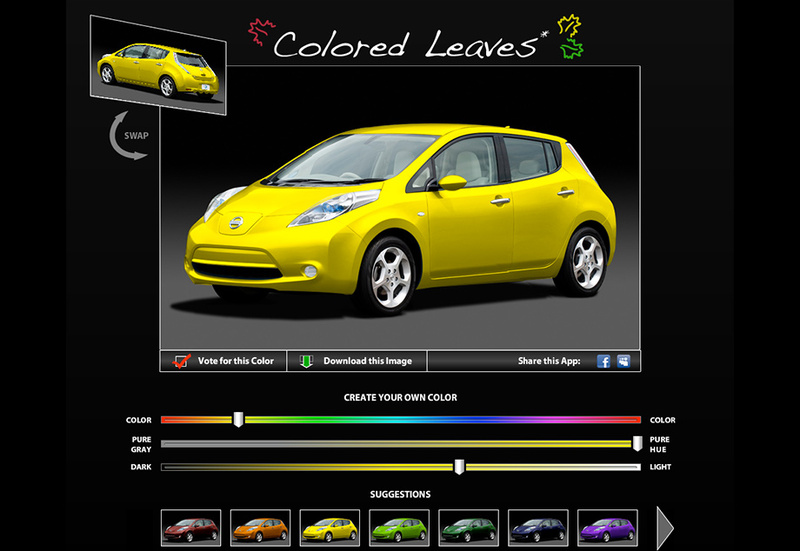 I didn't like the original palette of color choices offered for the Nissan Leaf (the world's first mass-produced electric car), so I made a visualizer to let users view the car in pretty much any color they wanted. The app manipulates pixel data with ActionScript classes such as ColorMatrixFilter. Users could control the color through Photoshop-like HSB sliders (Hue, Saturation, Brightness). This app drew hundred of users in first days after launch, and was featured on Autoblog Green, a prominent clean-energy car blog. I should note that this app was done as a personal project, and has no relationship to Nissan.